The stark reality for car dealers seeking greater understanding of how car buyers shop online in 2013 is that Edmunds.com has the ability to paint a vivid portrait of today’s online car shopper… Which includes 9 out of 10 new and used vehicle buyers! About 18 million visitors use the Edmunds.com site every month to shop for their next new or used car, and this gives the Edmunds team an unparalleled insight into the car buyer’s research and shopping process. 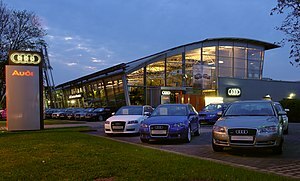 For as many years as I can remember, Edmunds has used the online automotive consumer activity to generate extensive research data and analysis to drive the sort of car buying insights that would establish itself as one of the more valuable resources for car companies and dealers to better understand car shopping and the way buyers use automotive information. Historically, Edmunds has made the analysis and insights available to their business partners and to the public through academic inquiries and media requests. However, Edmunds has not previously assembled together the complete volume of current time period data and the analysis and insights gleaned in one coherent piece. By publishing and making available the 2013 Edmunds.com Car Shopping Trends Report, they have provided the auto industry and especially dealers and automotive marketers with a true gem of a document. The report which ADM Professional Community members can download using the link at the bottom of this blog post, shows the results of extensive data mining within the Edmunds.com’s extensive database to reveal the most relevant car shopping and purchasing trends in America today. These trends offer direct clues toward ways that the automotive industry can move forward by empowering a more engaging car shopping experience. Throughout the 2013 Edmunds.com Car Shopping Trends Report, you’ll also find references to a 2011 survey conducted by “Added Value” on behalf of Edmunds.com that asked 2,476 online car shoppers representing the U.S. car shopper population to describe their expectations for their next car purchase. Edmunds correlated these responses to real-world buying data to see if shopper expectations match reality. In preparing their analysis and conclusions, the Edmunds market research team found many striking consistencies between the two sets of market research data. These surprisingly strong correlations between the two reports suggest that car shoppers have a strong sense of the automotive marketplace and that they know how to set reasonable expectations around price, availability and product performance. Two out of every three car shoppers consider themselves highly engaged in the car shopping process, and they turn to a variety of information to help them decide on a new or used car. Time spent on Edmunds.com is up 2 percent from 2011 to 2012. And the most-viewed elements by new car shoppers on Edmunds.com are reviews, pricing information and photos. Mobile access is becoming a powerful tool for car buyers. Traffic to Edmunds.com’s mobile site spikes on the weekends – and especially on Saturdays – when the bulk of car buying takes place. Shoppers are very good at anticipating how much they’ll pay for a new car. New car shoppers told us in 2011 that they plan to spend $30,500, on average, for their next vehicle. In fact the average transaction price for a new car the following year was $30,803. The average age of a new car buyer is about four years older than the average age of a used car buyer. Shoppers are turning to leases now more than ever. And the difference between the average monthly lease payment ($433) and the average monthly finance payment ($468) is greater than at any time since Edmunds.com started keeping records. Luxury car owners and shoppers are buying and considering more nonluxury cars. The trend speaks to the improved quality of non-luxury vehicles. Many shoppers say they want just the basics in a new car, but emotions can drive buyers to add options. New car buyers are willing to spend an average of $2,200 – or about seven percent – above base model and trim prices to add more options on their cars. The Edmunds.com’s 2013 Car Shopping Trends Report is intended to be a free resource for ADM Professional Community members who are interested in creating a better car buying experience. This is just the first in a series of reports that the Edmunds Research team hopes will shed more light on car shopping behavior. The team intends these findings to open up a dialogue which will contribute to the ongoing improvements within the automotive retail industry. They also want to encourage ADM Professional Community members to contact Edmunds at any time to discuss more ways that Edmunds.com can help you better understand today’s car shopper. via Edmunds 2013 Car Shopping Trends Report – Automotive Digital Marketing Professional Community. The verdict is in: if they view the highlights, you’ll view the taillights. In other words, the more car shoppers engage with your Vehicle Details Pages (VDPs), the quicker your cars will move off your lot— and that’s a fact. So how do you best position your automotive digital marketing strategy to be a VIN factory? We’ll address just that in an all-new Cobalt series: The Down & Dirty on Dynamic Inventory Merchandising. In this series, we’ll tell you how to harness the power of multichannel marketing to turn your dealer website into a VDP hot spot. Stay tuned for Part 1, when we look at the impact of Dynamic Inventory Merchandising in your dealership’s retargeting ads. The automotive marketing research firm Dataium has released their 2013 Automotive Shopper Intensity Report which has become a respected and widely regarded accurate predictor of new vehicle demand in North America. Each of the charts shown below are posted in the form of a PNG image that I created from the PDF version of the report. You can click on to open a browser window showing the full resolution for viewing and download. I have also included the PDF version of this report excerpt for file download by ADM Professional Community Members at the bottom… The following text, charts and tables are excerpts from the full report, which is available from Dataium for a fee by request. To request complete access to Dataium’s ASI predictive modeling tool on future consumer demand by make, model, trim level, segment, region, and market, contact Dataium at www.dataium.com/contact, or call 877-896-DATA (3282). The Dataium Automotive Shopper Intensity Index (ASI) is a leading indicator of Automotive Retail Sales. We show that Automotive Retail Sales closely mirror the fluctuations of the ASI. This index serves as an early predictor of the next 30 – 45 days of automotive retail sales. The index was relatively flat in December, up by a mere 0.39%, indicating a slowdown in January. Based on this, Dataium forecasts the US Retail SAAR in January to be 12.2 million retail units. With regards to makes, Toyota continues to outperform both the domestic and import brands alike, with three models: the Camry, Tacoma and Tundra included in the top ten new vehicle ranking for three straight months. However, overall intensity around the brand has gradually declined, with each model dropping a spot or two in the ASI ranking since November. For a second straight month, shopping intensity for mid-size sedans remained high, with three models within the segment ranking highest in ASI for new vehicles. The report identifies intensifying interest for the Honda Accord, which rose from 9th place in December, to rank highest in new vehicle ASI this month. However, the Accord faces strong competition in the New Year from the Hyundai Sonata, which, for the second month in a row, exhibited one of the largest month over month increases in its segment, and ranked second in ASI for new vehicles. A notable entry to the top ten ASI new vehicle ranking was the popular compact sedan from Hyundai, the Elantra. For the past two months, the Elantra has outperformed much of the competition in the compact segment in terms of shopping intensity. The ASI report also indicates that despite a slight bump in shopper interest owing to a recent redesign, the Nissan Sentra still trails other compacts within the segment. October 2012 –Influenced by the phenomenal growth of mobile devices to access the Internet, tablets and smartphones are being used by one in five new-vehicle buyers who use the Internet in the automotive shopping process, according to the J.D. Power and Associates 2012 New Autoshopper StudySM released today. The study analyzes how new-vehicle buyers use digital devices (computers, smartphones and tablets) and which websites and apps are used to gather information prior to purchase. Overall, 79 percent of new-vehicle buyers use the Internet (also referred to as Automotive Internet Users, or AIUs) to research their vehicle purchase. While nearly all (99%) AIUs use a desktop/laptop computer at some point in their shopping process, nearly 30 percent use multiple devices, including desktops, smartphones and/or tablets. The study finds that 20 percent of AIUs use a smartphone to gather information while shopping for a new vehicle, and 18 percent use a tablet. The majority of shopping among AIUs still occurs at home. However, tablets are not as mobile as they may seem. Most AIUs who use a tablet for shopping do so at home, while those who use a smartphone are more likely than tablet users to do so outside of the home, as smartphones are always within reach. Among AIUs who use a smartphone, 59 percent do so at the dealership, accessing vehicle pricing, model and inventory information, as well as comparing vehicles. The study finds that buyers go online nearly as soon as they decide to buy a new vehicle, and 59 percent of AIUs narrow their consideration list to one model during the final week before the actual purchase. With such a high volume of buyers deciding on the model of purchase so close to the actual time of the sale, the digital experience and dealer interaction are more important than ever. The vast majority (98%) of AIUs visit manufacturer websites during their shopping process, followed by third-party websites (81%); dealer websites (73%); and social media sites (5%). AIUs rely heavily on manufacturer websites for researching specific models and utilizing build tools, while they more frequently rely on third-party sites for comparing vehicles; reading vehicle ratings and reviews; and learning about vehicle trade-in values. AIUs use dealer sites primarily for inventory and dealer-specific information, such as directions/location, hours and contact information. Digital automotive research continues to have the most impact on brand and model selection, followed by price, which is relatively unchanged from four years ago. As a result of having product information accessible through websites and apps, new-vehicle buyers have more tools to help define their consideration set. Although mobile apps are still used by a minority of AIUs, the same shopping tools are being used across the two types of digital properties, albeit at different rates. The 2012 New Autoshopper Study is based on responses from 12,289 purchasers and lessees of 2010 to 2012 model-year new vehicles who used information gathered digitally in the shopping process. Headquartered in Westlake Village, Calif., J.D. Power and Associates is a global marketing information services company operating in key business sectors including market research, forecasting, performance improvement, Web intelligence and customer satisfaction. The company’s quality and satisfaction measurements are based on responses from millions of consumers annually. For more information on car reviews and ratings, car insurance, health insurance, cell phone ratings, and more, please visit JDPower.com. J.D. Power and Associates is a business unit of The McGraw-Hill Companies. McGraw-Hill announced on September 12, 2011, its intention to separate into two companies: McGraw-Hill Financial, a leading provider of content and analytics to global financial markets, and McGraw-Hill Education, a leading education company focused on digital learning and education services worldwide. McGraw-Hill Financial’s leading brands include Standard & Poor’s Ratings Services, S&P Capital IQ, S&P Dow Jones Indices, Platts energy information services and J.D. Power and Associates. With sales of $6.2 billion in 2011, the Corporation has approximately 23,000 employees across more than 280 offices in 40 countries. Additional information is available at http://www.mcgraw-hill.com/.